THIS MONTH, WE CELEBRATE CRAFT MEMBER AND POTTER, LENE KUHL JAKOBSEN. Working with clay for over 40 years, Lene trained first in Denmark before moving to Australia in the 1980's. Focusing on form and glaze, her work is known for its precision and minimalist approach. What first drew you to working with clay? As a child, I liked making craft — although mostly knitting and sewing. In my twenties, as a poor student, I made a lot of my own clothes with a sewing machine I bought at a market, which worked by winding a crank by hand. My first experience of clay specifically, was at high school. My art teacher then, was an accomplished local artist and we did some work in clay which I quite liked. His wife was ceramist Gudrun Meedom Baech. I found her work really interesting. I went to see one of her exhibitions when she showed locally but never got to meet her. She considered the form and line of each piece and that stuck with me. Your studied ceramics in Denmark in the seventies — could you talk more about your time as a student? In 1974, just before finishing High School, I sat the admissions test for one of the two Art and Craft Schools in Denmark. Months later, I was thrilled to be accepted into a 4-year, full time course, majoring in Ceramics at Kolding Kunsthaandvaerkerskole now the Design School Kolding. I liked the Ceramics course from day one and very quickly got to know the other 20 students in the class. We learnt hand building and wheel throwing, glaze chemistry and clay formulas for both low fired clay bodies and stoneware. The use of electric and gas fired kilns and explored drawing (especially from natural objects), colour theory, sculpture and mould making. And alongside all of this, I also studied archaeology. Why archaeology? 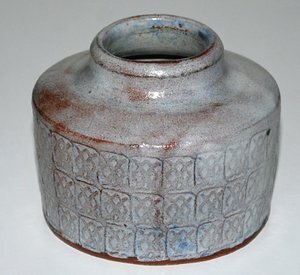 What was the connection with your study of ceramics? I think it was the pots. In studying archaeology, I saw these extraordinary shapes in pots made over 3000 years ago, finger prints and nail marks still left in the clay and I would look at these pieces and imagine the person that made them. In my hometown in Denmark, my friend worked at the Museum and one time, I was allowed to come and see some of the pieces they had recently dug up out of the ground. There was no display glass separating them from me and I could see them clearly. They had been in the ground for so long and were so well conserved. So much pottery is still being found in Denmark, and there are periods of history actually named after the particular decorative style or shape of the pottery from that era. Pottery can be so important in the study of archaeology. Other materials like textiles for example, can be lost over the years,. However, many works of pottery still remain and can tell us so much about the period in which they were made. Some might depict historical scenes or reveal trade routes through the particular variety of clay and/or shape used in each piece. What about after study? Did you work in studio pottery or go out on your own? In 1978, after having finished the course I moved to Copenhagen and was so lucky to find a pottery called Jesper Packness, where I was employed as a thrower. It involved learning a lot of new techniques in order to be both precise and fast when producing many items of the same shape all day. There were about six people working there, and every one of them had done a pottery apprenticeship, so I had to catch up quickly and get good at many tasks. A potter would throw 60 teapots which I would finish with spouts, handles and lids the next day. Beside throwing different range of works in various clays, I also got to glaze and fire the large gas kiln. As I lived around the corner, I could start the firing first thing in the morning. When there were less orders and at weekends, I could use the workshop to make my own works and pay to have them fired. So I became a member of a co-op shop where my work would sell alongside various other crafts and where I took part in two group exhibitions. The economy started to slow down in the early 80’s and after 4 years the boss downsized to a one-man workshop and I had to look for other work, doing a watercolour and and English literature course to fill in time. What inspired your move to Australia? I had been on a holiday in Samos, Greece that summer and met an Australian man, Peter, and he followed me to Norway. It was very interesting for us to live and work through a winter above the Arctic circle. Nature there is such a strong influence and small changes makes each day different. Peter had been travelling and working for such a long time and when he decided to return home to Melbourne in 1985, I followed him. I remember reading that when you arrived you found and began to work at Pigtale Pottery (1981-1994) on Brunswick Street in Fitzroy, which was run by Anne Gillian and Maz Wilson. 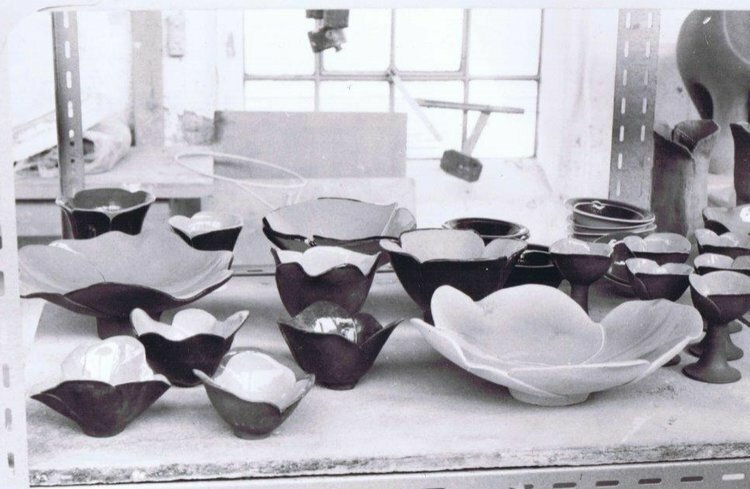 Could you talk about your time at the studio and the Australian ceramics scene at the time? I arrived in Melbourne from Denmark in August 1985. My Australian boyfriend Peter and I stayed in Preston to begin with. I had started to look around for ceramic places when a neighbour told me that she had seen a notice about a pottery job on a shopdoor in Brunswick Street. I went there the next day and found ‘Pigtale’ Pottery on this my first visit to Brunswick street. I met with Melinda who was looking for someone who could work on a pottery wheel and shortly after I started to make the plates she wanted to decorate. We worked upstairs above the shop with little equipment and water had to be carried up and down in buckets. This was quite different to the potteries in Copenhagen and Norway where I had worked previously. Soon afterwards, I was able to rent I a room above the shop, I bought a second hand wheel and started to make and sell my own pieces as well as working for the women who were not ceramists but very creative so we learned from each other. I went back to Denmark to sort out things for a permanent move to Melbourne in 1986. And got married to Peter. Throughout your practice, you've worked with potters like Sandra Bowkett, travelled and exhibited internationally and nationally and more — how have you seen Australian ceramics change over that time? How has your practice changed? Sandra Bowkett joined Pigtale Pottery and we started sharing a work space and have been friends ever since. I had two daughters in 1987 and 1989, so for many years my time was divided between family and ceramics. I set up a studio at home in 1992 with an electric kiln and the old pottery wheel which is still going strong. I held my first solo exhibition titled ‘Once Upon a Beach’ at the gallery in Pigtale Pottery. I was a member of Victorian ceramic Group for many years and served on the exhibition committee for a while attending many talks and workshops and meeting other Victorian ceramists. I always found Australian ceramists to be open and sharing and I enjoyed participating in numerous group exhibitions. I like the challenge of creating works to a theme and often make sculptural works for exhibition. I have been a Craft member for many years, taking part in exhibitions and selling in the store. During all my time of making I have enjoyed making pieces which will be used by a buyer and it is quite a compliment if someone says that I have made their favourite teacup or vase. I try not to follow what is the latest trend but instead to work on shapes and looks which hopefully will stand the test of time and continued to be appreciated in someone’s home. Your work is known for its quiet precision and sculptural forms. Your bottle vases for example involve a complex process whereby you remove and then reattach the bases of each piece in order to complete the form. Could you talk more about this? This latest vase design is an oval bottle shape vase in different sizes. As most of my work these are made on the pottery wheel and later pressed into an oval shape having been thrown without a base. Later on, I attached a new base making sure the join is not visible. I fire some of the vases in my kiln but have also been lucky enough to get some fired in Sandra Bowkett’s wood fired kiln. I help with the packing and the 16 hrs stoking which is also a great opportunity to catch up on family and pottery news. What are some of your favourite collaborations from over the years? In 1998, I collaborated with Lone White from Cairns who is a Danish – Australian ceramist. We took an exhibition titled ‘Influences ‘our home town and held several talks and presentations of Australian ceramists works. Among the places we went to, was my old school where my pottery teacher still taught. In 2008 I had an artist residency in Denmark and the year after exhibited ‘Edaphic North’ at Pan Gallery. This show was based around the change of seasons. You travelled to India to meet and speak with some of the potters there — could you talk more about this experience and what it brought to your practice? In 2010, I joined a group of ceramists on a trip to India arranged by [Australian potter] Sandra Bowkett. We held an exhibition and visited other potters. It was a great experience for me, as I had not been to India before. One of my strongest memories was when we went up to the village Andretta. I remember driving up this little road and all piling out of the bus when we arrived. Everyone was so welcoming and we were taken into this kind of trainee workshop which they had cleaned and swept. On each wheel, sat lit candles which flickered in the evening light for the ceremony for Diwali. In my time there, it felt like the work and the culture — the spiritual part of that, hung together. I think sometimes for us here, if you're not religious, we maybe don’t have those connections. I felt they had that so much more, and it was nice to have a look in towards people who had a spiritual grounding to their work and community. We are the ones who are more disconnected in a way in our modern lives. Looking back on my time of making pottery in Melbourne I have had many opportunities to get my work into exhibitions both in Victoria and Australia wide and to sell works in galleries, shops and markets. A few times I have been awarded prizes which is a great encouragement. It seems that ceramics has had a revival which is interesting as many courses for learning ceramics have closed down. My time is still divided between ceramics and family as I now have 2 granddaughter whom I enjoy looking after when needed.